MADISON, WI--(Marketwire - June 5, 2007) - On June 14th, 2007 at 4:00 PM CDT on www.OR-Live.com, the Dean & St. Mary's Cardiac Center will give viewers the opportunity to view a live heart procedure, in partnership with Channel3000.com. Viewers will get to observe a live cardiac catheterization, featuring Drs. John Phelan, Alan Singer, Daniel Danahy and Robert Tancredi, as well as a possible angioplasty and stent placement. The program will also include a taped segment about the Level One Heart Attack program, illustrating the roles of EMTs and hospital staff in getting heart attack patients to the cath lab as quickly and efficiently as possible. Throughout the program, our team of cardiologists will explain the procedure and decisions being made, and answer viewer questions. Their preeminent expertise comes from the fact that St. Mary's Hospital performs more cardiac catheterizations than any other area hospital, having performed over 2,800 cardiac catheterizations in 2006 to look for blockages in arteries. In a cardiac catheterization, a catheter is inserted into an artery in the leg and up to the heart. A dye is injected into the arteries, which allows cardiologists to detect blockages on a monitor. If blockages are found, the cardiologist may perform an angioplasty, where a small balloon is inflated near the blockage to open the blocked artery and restore blood flow to the heart. In some cases, a wire mesh tube, known as a stent, may be inserted to keep the artery open. The goal of these procedures is to restore proper blood flow to the heart, preventing damage to heart muscle and relieving chest pain. The Dean & St. Mary's Cardiac Center is the most experienced cardiac team in southern Wisconsin, and was the local leader in developing cardiac catheterization into an outpatient procedure. 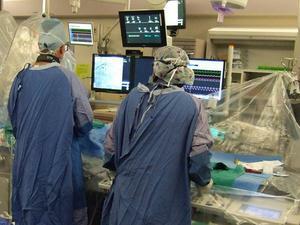 The Cardiac Center performs the most bypass surgeries and most angioplasties in the area. In 2006, they introduced the Level One Heart Attack Program, to improve the speed and quality of care given to heart attack victims throughout the region. St. Mary's was the first hospital in Madison with the revolutionary new 64-slice CT (computed tomography) scanner, which allows doctors to capture detailed images of the heart and arteries in seconds, without any invasive procedures and with no recovery time. And the Cardiac Center is the only program in the region performing mini-maze heart surgery. In 2006, St. Mary's was recognized as a Solucient 100 Top Hospital. According to the American Heart Association, one in three American adults has at least one type of cardiovascular disease. In 2004, approximately 1.3 million cardiac catheterizations, and an estimated 664,000 percutaneous coronary interventions (angioplasties and stents) were performed in the United States.